I am so addicted to the crazy of this show that nothing else really matters. I have no feelings for any one character or really the storyline at all, I just really want to see what happens. It is a strange feeling that I didn’t know I would love until now. So let’s get started! Recap Countdown: Starts now!…Check twitter for updates! Grandma Jo sees Yura putting on makeup in the bathroom and yells at her. DID I JUST HEAR WHAT I THINK I HEARD! YOU BATH B***H!. Yura apologizes and says that they love each other. But Jo says that he already has a queen, you should stop! Yura tries to plead here case and says that they already loved each other. This is all the Queen’s fault. Jo wants her to leave the palace. Yura says that no one but the Emperor can kick her out. Meanwhile, Suni stands back up and is actually carried against her will backc to her bed by Wang-sik. Wang-sik delivers her all the way to her bed. Suni wants him to leave and asks him if he also does not respect her as well? Wang-sik is a bit hesitant to leave, but he does. Then she calls Yura and asks her where she is right now. The Emperor goes to his old wifes memorial resting place in the palace and tells her to go away from my memory! You are dead! Just leave! he starts to destroy everything and grabs hr ashes. he is about to destroy that too, but Wang-sik tells him to calm down and basically stop. Hyuk starts to punch Wang-sik over and over again. He grabs the vase to break it, but does not. Cut to the two of them sitting against the wall like best friends. WS tells him that he will not tell anyone. He also bandages his hand. Hyuk looks at him as if Wang-sik might be his only friend in the palace. He also looks like he regrets punching him. So he asks him if he would like to go with him tonight. Back in Suni’s place, Suni tells Yura that the prince got so angry. Yura pretends like she does not know why but she does say that she heard the old Queen used to prepare this a lot because the King liked it. Maybe that is why. Suni thinks Hyuk might have misunderstood her. Yura apologizes a lot Suni but Suni tells her that it was just a misunderstanding, they can resolve it. Elsewhere, Hyuk takes Wang-sik to his garage and throws him a helmet. He tells him it is dangerous, but he does not want to be stopped. Wang-sik says he will protect him from behind. They take off on two motorcycles. Hyuk starts to think abuot the former Queen as he is driving. He thinks about loving her and kissing her and smiling with her. Wang-sik thinks about his mother as he drives behind Hyuk. They are both crying. meanwhile, Kang is eating at her favorite outside area when she gets a report that there was a lot of ruckus from the queens room. Maybe her and Hyuk had an argument. Then a Royal guard comes in and says that he can’t find Hyuk, the gps does not work anymore. CCTV footage shows that he is driving away on a motorcycle. The Queen hops up and tells the head of the guard to find him right now! Cut to the motorcycles, it looks like the Royal guard found them and are chasing him in their black SUVs. Hyuk tries to speed away along with Wang-sik. But they are corned on the bridge and have to stop. Back in the palace, princess Sojin tells Suni and Kang that the King is missing. This is a huge deal, I thought he went to your room, don’t you know? Yura is there as well so she tells Suni that the Emperor had a huge accident before so they banned him from riding it. The Emperor comes back in. The Queen walks up to him and asks what happened. Kang slaps Wang-sik and says that it is his job to protect the Emperor! This should not happen again. Put him in our jail cell! The head guard takes Wang-sik away. Kang walks back up and asks Suni, you did not know he left! Suni apologizes to Kang and tries to talk to the Emperor, but he walks out. Yura smiles at Suni and then walks away as well. Wang-sik sits in the jail cell. The Emperor shows up and apologizes for having him sit in jail. But he does feel better because of him. The Emperor wants to let Wang-sik out. But Wang-sik says that the Queen was right. he should have protected him better. WS is let out. Hyuk asks Wang-sik to do the same in the future. The head guard reports this to kang. Kang thinks this is so strange, he does not trust people but let his guard out. I don’t feel good about this. Keep an eye on Woo-bin. Grandmother Jo tells Hyuk that she thought Yura was his chief secretary, is she your girlfriend as well? Hyuk says that is true, she is my lover. Jo yells, YOUR LOVER! Then why did you marry Suni? Hyuk says that it was his only way to protect himself and Yura. Jo tells him that is so irresponsible. What about Suni? She only looks at you and married you because she loves you. How can you betray someones heart like this? Hyuk – You want me to be happy? Just leave us alone. Min Yura is the only one that lets me breath in the palace. Please grant our relationship. I don’t want to be against you Grandmother! Outside, Suni meets with the mother and tells her that she did something that she should not have done in order to have a better relationship with the King. She heard he liked flower and potato pancakes, but that reminded him of his former wife. Kang asks how she knew it, did Yura tell you? Suni says yes, but don’t yell at her. Kang basically tells her that she should not trust anyone in the palace. Do you know why the crane thing happened? It is not just a coincidence. Someon did this on purposed, they cut the hose. Suni is shocked, who would do that? Why? Kang tells her that this is hr position, she can be attacked while sleeping and has to endure all those people that envy her. To keep your position longer, you need to be careful of anyone around you. And you should especially be careful of the people that are close to you and are nice to you all of a sudden. They are the most suspicious. The princess overseas a meeting about the mall. Helrio is all there and is one of the main people talking. It looks like Sojin wants a book signing even with a famous person (Vincent Lee?) and wants Helro to take care of it. It is an impossible task but HR says she will take care of it. She runs off to try and get Vicnent Lee to do the signing in the Royal shopping mall. But the manager/editor jut sends her away. Yoon is there and sees this interaction. But it looks like Yoon is also Vincent Lee. he says that he does not like signing. he will sign with someone else if he cannot keep the promise. The editor tells him that no one will bother him! he throws away Helro’s business card. Back in the palace, Sojin gets a massage in a massage chair while Ari compliments her about her skin. She brought her some fruit for her skin. She yells for her nanny to come in. Her nanny comes in with the fruit and the princess starts to read the news. But Sojin thinks that the princess should not read these things, she is only 7 years old! The nanny says that the Princess is so smart and learns everything quickly. But Sojin does not care. Later on, Ari meets with Hyuk and asks him how his night went. She tells him that she could not sleep becuase she was worrying about the Earth. If they cant change global warming then I am worried about Earth. Hyuk is working and tells her to leave. Ari says okay and asks for him to watch his health. Hyuk then tells the nanny not to let Ari read all these world issues and just let her play with dolls that match her age. Also, she does not have to greet me everyday. The nanny and Ari both look sad about it but they say okay. Suni comes in, and sits with hyuk. She apologizes for what happened last night, she did not try to be princess Sohyun. Hyuk tells her that he does not want to talk about it. Suni wants to know what she can do to make him happy again. Hyuk tells her, if she is sorry just a little bit, then don’t come to see me or visit me exept for the public schedule. Suni is shocked and hurt, she does not know why he is this angry. She apologized to him so many times. Just tell me if you like something or don’t like something. DOn’t you know my heart, I want to have a good relationship with you. Hyuk tells her that he does not want to get angry with her. Suni tells him that she was about to leave becuase she does not want to get hurt becuase of him anymore. I DID NOT KNOW THAT YOU WERE THIS DOJUN! (narrow minded). He looks up and wonders how she can use that low class word. (Dojun – narrow minded). Suni limps away. Wang-sik asks her to sit for a moment outside, so he can check her leg. It is pretty bad and is swollen more than yesterday. He asks if it really does not hurt? he puts a hot pack (or ic pack) on it that he carried in his pocket. She tells him that it hurts. He says it will be okay soon so she can stop crying. She says it not – well, I am crying because of my ankle, that is true. He says he knows. Yura comes up to them and says that she was worried about her ankle, but it looks like her bodyguard is taking care of it. Suni is a bit embarrassed and goes into her room. Wang-sik tells Yura thta her ankle is worse than yesterday, so pay attention to it. He walks off. Yura looks at him. Inside, Yura tells Suni about her schedule for the day. then she tells her that seh will work outside becuase she has an order from the Emperor. Suni smiles brightly and says that she can go out. Yura leaves. Suni thinks that she just needs to endure this more and wonders how she can see him tonight. Cut to Yura at a huge meeting. Yura – I am Min Yura, I represent the Emperor and will be running this shopping mall business. We have a lot of work to do so i will not do a ceremony. The princess, Sojin bursts in and yells at Yura. How dare you take over! How dare you! Yura is just calm and tells Sojin that she did a lot of bad things on the company books. She should be thankful thta we are Co-CEO’s because your mother wants to give you one more chance. But I am not patient like her. Soin keeps yelling and says that she will screw up everything! 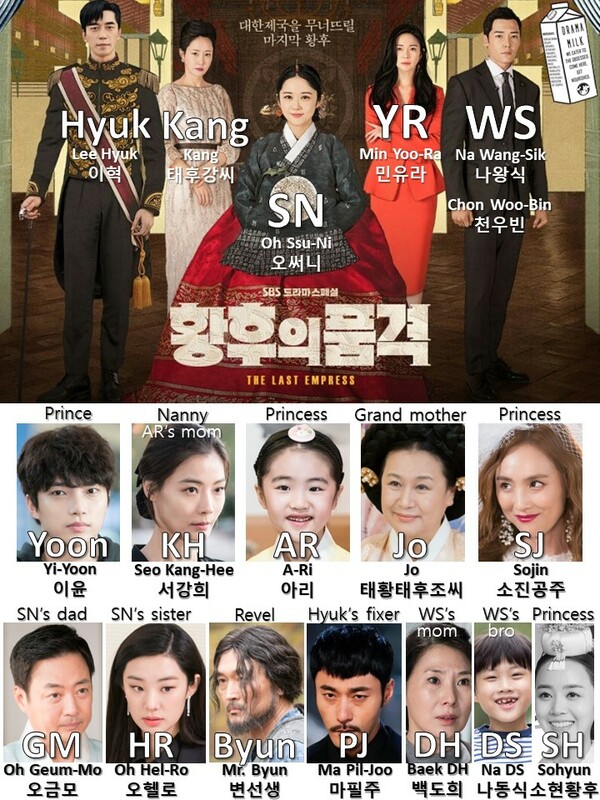 Another scene change to Grandmother Jo and Mother Kang. She wants to know why Kang did not tell her from the begining that Yura is Hyuks woman. Kang says that she wanted to kick her out before the marriage. Grandmother Jo apologizes and cries, she says that she pities the new Queen. Sojin bursts in with a face full of makeup smudges tears and tells them that Yura has taken over the company! Kang tells her that she did not have time to discuss it with you. Sojin keeps crying. Jo asks what happened so Kang tells her that she gave Yura this job to keep her busy. Sojin tells her, I EVEN DID THAT THING TO BE THE CEO. Grandma Jo is all like, what did she do? Kang tells Jo that it is nothing, she is just angry now. She tells Sojin that she will talk to her later. Sojin walks out upset and yelling. Cue absolutely random swimming scene where the King and AW swim together in the palace pool. The head guard is given Woo-bin’s background check. There is nothing out of the ordinary there. At the same time, the two fellas finish swimming. Hyuk tells WS that he is good at swimming as well, it is fun to compete against you. Lets do it one more time. Switch to Helro all upset at her father for hiring a part-timer in his small restaurant. The father says that he is the inlaw of the empire so he should do a public service. But HR tells him that this is why he wanted to make her sister the emperors wife? You are using someone elses money. Just stop, I thought you became better. Appa leaves, one the guests in the restaurant is Yoon (aka Vincent Lee). he looks at the sign for a part time job). Ari tells Sojin, that she should not drink like that. She calls hr mother. But Sojin just yells at her to not call her mother and to leave! Just go away from me! She pushes her out. The nanny asks Sojin what she is doing! Why did you make her cry! Sojin says that she is a sinner since the day she was born! The nanny tells her that she cannot say that, this is your daughter. But SOjin says that their deal has ended to this day. Why, do you worry about her becuse she is your daughter? The nanny looks at her, shocked. Kang comes in and tells them all to watch their mouths, if Grandmother knows this then she will kick all of us out. But Sojin thinks that she is the one that is always giving. She became a mother all of a sudden, but she got the mall at least. However now she is stipped from the mall and still has this baby. Kang tells her that she will remove Yura soon, just wait a little bit. We open in Suni’s room, she is told that she did not have to go to the event today. The Butler who tells her leaves. Suni smiles but wonders how he can cancel this event, ah, jongpangi (narrow minded person, insult). She starts to hit her chair and kicks the air like Karate Kid. But then Grandmother Jo comes in so she stops what she is doing to greet her. Grandmother is happy to see her and tells her that she did not know she was good at martial arts. Lets go on a date today. Suni says that she has a lot of time so that is cool. She will play hard, paksaegae! Grandmother starts to drink an energy drink (ad placement) and says that she is super energetic now! They head out incognito in the city. No one recognizes them. They walk arm in arm and have a fun time walking around with no one recognizing them. They eat street food and try on cute earmuffs and play with crabs. halmoni looks at her in a loving and yet sad way. Uh oh. Then grandmtoher tells her that they have to go somewhere. Cut to a meeting with Hyuk, kang, and Suni’s father. Grandma Jo says that she called him ahead of time to come in. She winks at Suni. They start to eat her fathers chicken in a low class way. Kang and Hyuk look like they do not want to eat it but Grandmother Jo jumps in to eat as well. Appa says that Suni is so skinny, maybe the emperor is not letting her sleep evey night. he chuckles. Then he igives man power alcohol to Hyuk and tells him to drink it. He should have a prince soon so be strong. Hyuk bows and says that he will take it later, but he stands and says that he has another schedule. he will have it next time. He gives Suni a stern look and leaves. Kang tells Suni that she is comfortable with her father, but she has to keep hr dignity as the Queen. Jo tells her not to talk about those things at this nice event. they are just happy to see each other. kang says that she will leave so they can keep meeting each other. She leaves. Appa lets out a deep breath and says that he can breath now, so uncomfortable, they are not like you Queen Jo. She smiles. he asks if he can call her Tae-tae mama? (Before It was Taewang tae woo Mama). She smiles and says that is fine. Then she asks if she can have that drink, is it only for men? Jump to Kang grumbling about her low class in-laws. But she sits up when the secretary says that the Prince is back in the country. She tells her secretary to find him. Yoon has started working at the restaurant now, he is the new part-timer. HR comes in and asks who she is, she has her angry face on. he introduces himself to her and starts to eat someones leftover chicken. She thinks he is dirty and tells him not to, but he is perfectly fine doing it and wants to shake her hand. In the palace, Sojin calls HR to ask about Vincent Lee, please find him or I am dead. HR says that she knows where he stays so she will meet him tomorrow. Yoon hears all of this. He runs out and tells HR to take care of the store. But outside he says that he has to change his hotel again. Yura goes to the event with Hyuk, they are dressed to the nines and surrounded by security. They both go inside and sit for a game with the Chinese Emperor and his wife. They start talking about the charming Queen (Suni) but he says that today he has his secretary with him and introduces Yura. They start to play Majang. Wang-sik looks at them both and tries to keep a blank face. Piljoo looks through WS’s things in his bedroom and at his desk. He finds a pain killer. VO – His name is Chun Woo-bin, the new guy pointed a gun at the Emperors head…what medicine is this? Back in Suni’s room, she sits on her bed bored and sad. She even says that she is this sad so the emperor should not be happy as well. Why did he go to the party alone? She grabs her computer and sees that yura went to the meeting with Hyuk. She starts to think about what Kang says. VO – You should suspect the one that is closest to you, the one that is nice to you with no reason. That person has a high probability of being your enemy. Suni immediately thinks that Yura is nice to her with no reason…. Somewhere in the palace, all the palace officers are eating in another room. Someone accidentally spills something on Wang-sik so he goes out to clean it. Piljoo comes in and asks where their boss is.They all go out to find him which clears the room. So Piljoo picks up Wang-sik’s phone, it is Dong-sik on the phone. Piljoo asks him if he is Na Dong-sik. Later on, Piljoo taps Wang-sik on the shoulder and says that they know each other….Chon Woo-bin. He takes him to a quiet spot so they can talk and then says that he tricked him, he never expected him to be here but he is the Emperors personal trainer and instigated the Emperor and got his heart. Wang-sik asks who he is talking about, who is Wang-sik? Piljoo tells him to stop fooling around! Your act is all done! He pulls out his phone and says that someone was looking for Wang-sik, you brother, Dong-sik. And Wang-sik needs painkillers. I HIT HIS HEAD WITH MY GUN! YAAAAAAA. You are so skinny now and you don’t use saturi. He takes a call from the Captain and tells him to send the kids~. But then they both pull out their guns on each other. Wang-sik says that it is him, nice to see you again. HOW DARE YOU COME TO THE PALCE, DO YOU WISH TO LIVE! I wanted to kill you by myself, but this is a little quicker than expected. the day you recognize me is the day you die. You shortened your own life. Do you know that the Min Yura that you loved so much is the emperors woman? Min Yura was a big part of your mothers death. The emperor hit your mother but Yura hit your mothers head with a rock. HAHA. You should die knowing this much, then you will have no regrets. have a nice talk with your mother in Hell. I ERASED EVERYTHING! becuse Yura paid me. Someone yells for Piljoo which distracts him enough for Wang-sik to hit him and fight him to the ground. DIE, YOU ARE WORSE THAN AN ANIMAL, DIE! They keep fighting. Piljoo tries to kill Wang-sik with a plastic bag. But he gets away and they fight again. But Piljoo tries to kick him so Wang-sik grabs him and spins him around to the side. But they land on some sharp things, like a sharp standing furniture piece that they both crash into it. Wang-sik gets stabbed in the arm, but Piljoo gets stabbed in the chest. He looks dead. Someone calls Yura, on the phone it says “Oldest Uncle” but it is actually Piljoo’s number. She asks why he is calling her. Wang-sik tells her that it is Wang-sik. Cut to Wang-sik throwing gasoline or something on Piljoo in the back of a car but the gas is not coming out steady so he has to jerk it around. He tells Yura that he came there to kill Hyuk, but he killed Piljoo instead. you will not be able to find his body becuase I threw him in the sea. Next is Lee Hyuk’s turn. Piljoo told me everything. He says that he has CCTV so he will not be able to deny it. Wang-sik tells her that he does not want to hurt her so she needs to be away from the emperor and the palace. You are his secretary, but you are not guilty right? Yura – Listen, oppa, you cannot win over the emperor so just turn yourself in and I will find a way to save you. WS – No, Hyuk will die by me tonight, I am ready to put my life on the line. Tell me when the dinner ends. Yura runs back to the dinner and tells the Palace guards. hey all quickly leave with the guards surrounding Hyuk and Yura. Their cars drive up and the Emperor gets in. Yura bows him away and the cars drive off. Then the head guard dries up and Yura gets in his car. Wang-sik is watching this all in his truck with Piljoo’s body in it. He knows where everyone is going on his map. They are taking the emergency exit and they need support. Wang-sik drives to the emergency detour and rams one of the Royal cars. Huge chase scene as Wang-sik hits a lot of the Royal cars with his truck. then he drives off. The other cars follow him and shoot up his car. They goal is to follow him and not let him escape! But then we see that the emperor actually comes out again from the hotel in a second group. he calls someone and tells them that they need to talk care of wang-sik now. In the car, Wang-sik tells Piljoo that this is his revenge to him, he will die as the Wang-sik that you killed! He shoots Piljoo in the head and then turns the car off of the cliff. It flips several times and then explodes. Yura watches from the top of the highway with the head Today guard, but then smiles. At the bottom, we see that Wang-sik is perfectly fine and hiding near the car. Later on, Yura tells Hyuk that Wang-sik drove off the cliff. Hyuk thinks that is fine, but he tells her that they need to burn all his things! I will not forgive anyone that betrays me, even after they die. Wang-sik is outside Hyuks’s room listening in. The head guard tells him that he did not see him at the hotel. Wher were you? Wang-sik says that Piljoo was attacked so Wang-sik helped him. He had a sword. WS’s arm is all bloody. Hyuk and Yura come out of the room and asks what that guy looked like? Wang-sik says that he was noticable large and spoke with an accent. Yura confirms that that is Wang-sik. They leave. But the head guard still suspects Wang-sik and tells him not to be relaxed he has his eyes on him. Yura and Hyuk happily walk away as if this all has been settled. Wang-sik walks away as if his world is destroyed. VO – Min Yura was the one that hit you mother with a rock! Wang-sik grabs something sharp and follows Yura and Hyuk. Buthe stops. VO – wait Yura, you are next! I will not kill you too easily! When you are at the top, I will find a way to make you suffer the most! I will kill you! Cut to Suni in her room. She has a flashback talking to someone about all that happened adter the Emperors wife died. The secretary tells Suni that the Emperor used to like that flower but he burned it all after she died. It is banned. And the potato pancake is also banned in the kitchen. Suni asks if anyone doesnt’ know about it? The secretary says that serving the Emperor is the most important thing, so of course everyone should know. Suni hurries out of her room and to the Emperors room. She tells Wang-sik to tell the Emperor that she is there, but he says that the emperor is not there. He cannot say where he is during his unofficial schedule. Suni starts to leave, but grits her teeth and turns back. SN – Who am I? I am asking you who I am. WS – You are the Queen. SN – That is why I am asking you to take me to the emperor, Guard Chun Woo-bin. Jump to a fabulous yacht where Yura and the Emperor are enjoying their time. He tells Yura that she does not need to worry about anything, his grandmtoher already knows about her. Yura is worried about the Queen. But Hyuk tells her that she should just worry about him, he is a bigger worry than the Queen (Suni). Yura smiles and tells him that she loves him. They hug happily. On the bridge, Suni watches the yacht floating under the bridge. She sees Hyuk kissing Yura passionately. She starts crying. Wang-sik is with her and is trying not to cry. Suni has a tear fall, it hits her bracelet that she made for the her and the King, it breaks off. Wang-sik tries not to cry and looks at Suni. he covers her eyes so she does not look at it anymore. She tries not to cry and looks at Wang-sik. It looks like Suni is about to turn bad? Is she going to go full on evil? Probably not right, maybe just bad enough to make me love her. Though honestly I love everyone in this show, everyone, it doesn’t matter if they are good or evil. Y’all this drama is 24 episodes (48, thirty minute episodes), so they have a lot of story left to tell! Where in the world is this going???? I am here for this. Suni – I saw you and secretary Min together last night. Hyuk – Trust is the most important thing among married couples. Suni – Why has no one told me to trust my husband one more time. WS – Don’t suppress your feelings, my queen. Right! He is not messing around. So HAPPY that he is DEAD!!! He was same BAD guy in Fox Bride Star!!! YAY For WS!!!! Hahahaha! Why he gets cast in a bad guy characters all the time? Yes, he was that bad guy! He was also a bad guy in Mr. Sunshin, though he was on the group of Bad guys that you ended up rooting for in the end. But he was still a bad guy. I’m certain she will and her and WS will be a team and get both of them! I think there will be a lot and a lot of twists along with way and will keep us on the edge. I’m just glad WS and Suni are in the same page!! Love all the twists in this drama. Yes! I want that, too! 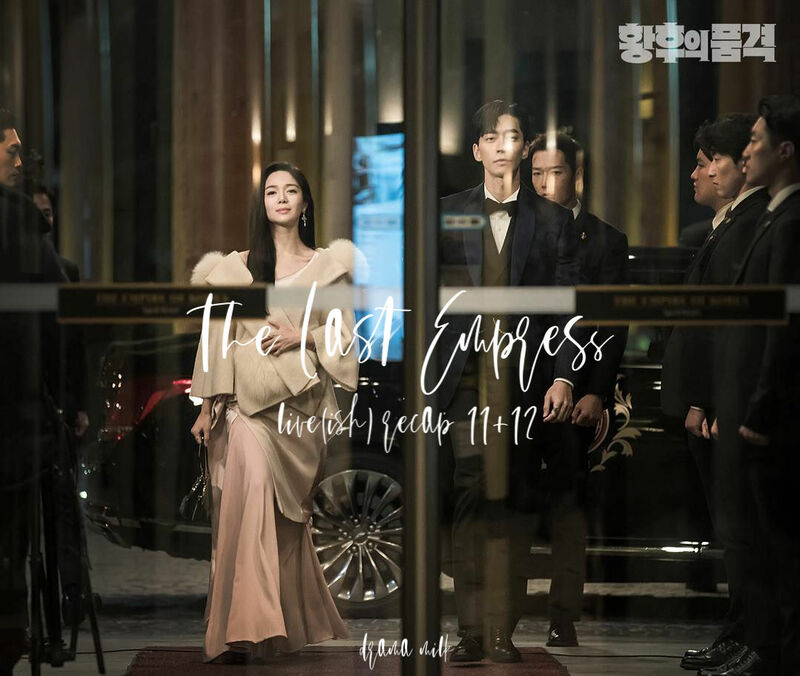 Btw, it just got me thinking, the title of this drama is The Last Empress, but right now we have 3 empress here, does that mean sooner or later 2 or them will die and Suni will be the only one left? Given with the reputation of this drama with all the death, its not impossible. That is a great thought. That might happen. I think that is the beginning of Suni’s dark side transformation! love this drama….with all the crazyness..